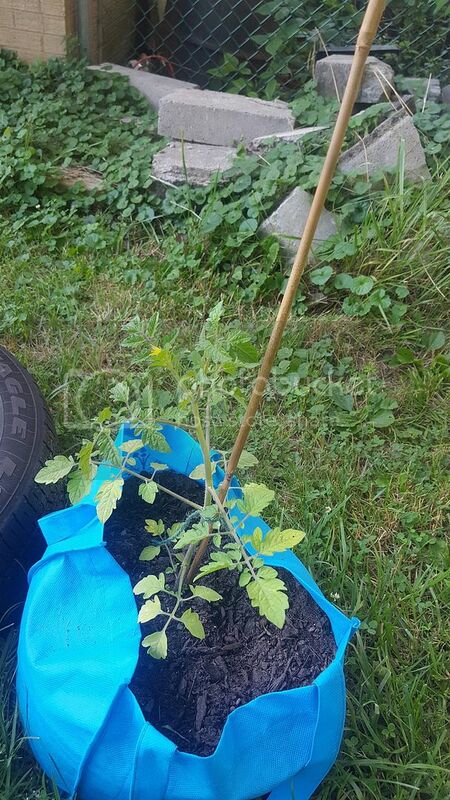 Newcomer to the forum and gardening, Problem with tomatoes? Hey everyone!!! Me and the finacee are from PA, and this year decided to start planting some vegetables in our backyard. 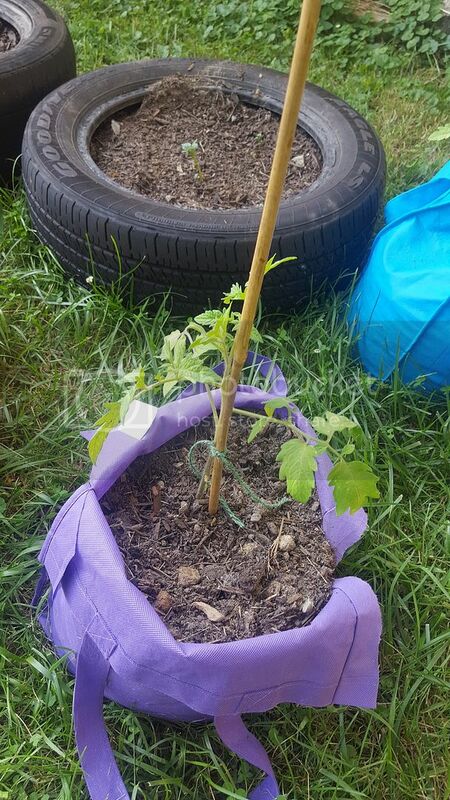 We are growing our plants above ground (the tomatoes in those walmart cloth bags, some lettuce, spinach, and carrots in a kiddie pool, and some green beans in a nice wooden "box" made, and potatoes in tires i got from work), and most of our plants are doing good. The green beans sprouted fast and are growing tall, the carrots, lettuce, etc are all growing nicely, and the potatoes have just sprouted and look great too. The tomatoes we got them as young plants, and I'm not 100% sure what we are doing wrong. We just fed them last week thinking that might be it, but we've also had 2 days of heavy rain since that feeding. yellowing leaves like that would seem to be over or under feeding. Is there drainage in those bags? You will need to make some holes if not as it's possible to rot the roots if the water isn't draining. What soil have you used? Is it garden soil, potting mix or something else? How often have you been watering? 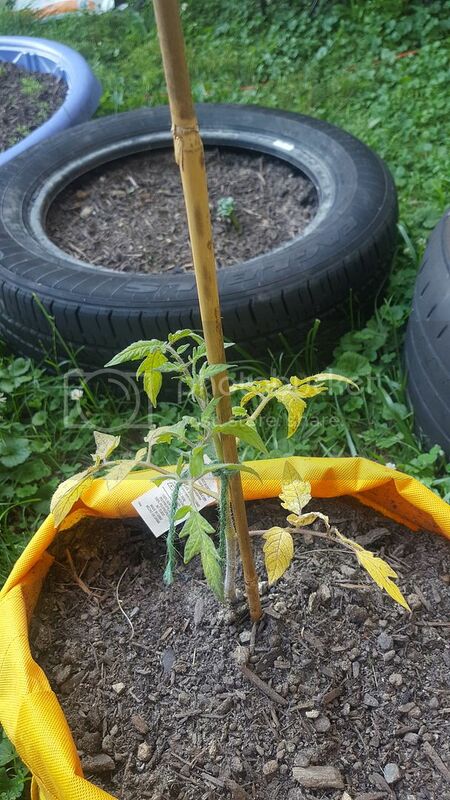 TomatoGirl wrote: yellowing leaves like that would seem to be over or under feeding. Is there drainage in those bags? You will need to make some holes if not as it's possible to rot the roots if the water isn't draining. What soil have you used? Is it garden soil, potting mix or something else? How often have you been watering? No holes in the bags. The setup I saw said nothing about holes. We used a mixture of top soil, compost, and peat moss for the soil (with mulch on the bottom to help drainage). Fed once, Planted about 2 weeks ago, and watered about every day to every other day. Do you have an extra bag? Test by filling it with water and see how much/fast water drains out. The Walmart bags I have are kind of small -- ripped easily too. But that another matter. point is I don't think they hold even 5 gal in volume. 2 gal maybe? 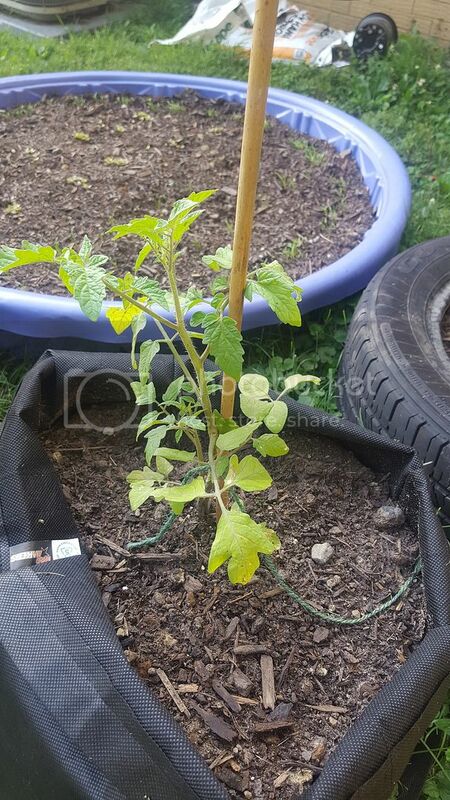 Very -- too -- small for growing tomatoes. I have seen them used with self-watering setups like raingutter system. THOSE maybe could handle the high demand required by tomatoes, so I think you will run into more problems down the road. Intuitively, I think you should have added dolomitic lime and perlite or at least sand or pea gravel. The mix recipe sounds too moisture holding and not well draining. More so if the bag doesn't drain well without holes. Mulch on the bottom will just be a layer in which the roots will suffer nitrogen deprivation. 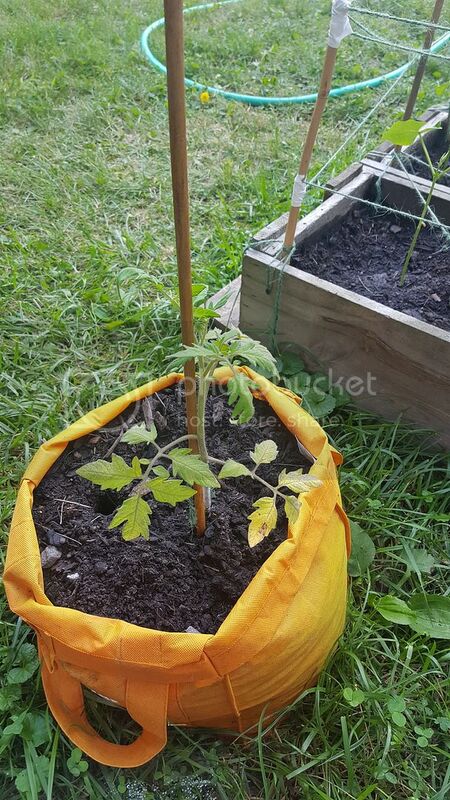 If your plants suddenly started to yellow, I think that would be a sign that the roots have reached that mulch layer. applestar wrote: Do you have an extra bag? Test by filling it with water and see how much/fast water drains out. should I move them to another planter or something while they are still young? 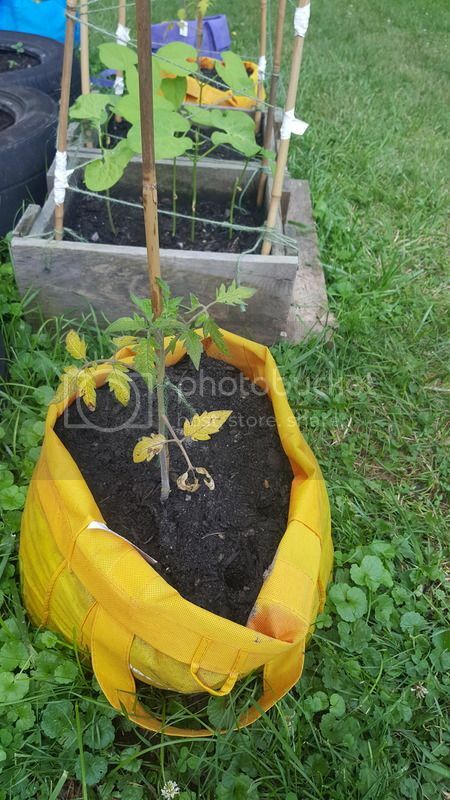 I do have another bag I can see how much water drains out and how fast..
What do you suggest we do? They don't look dead yet.. but I don't want them to die! What is in the soil mix? 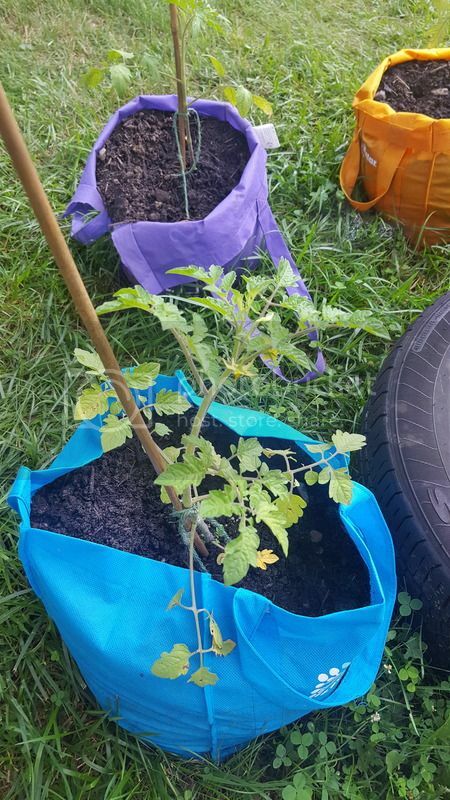 I would move the tomatoes either into the ground or at least a 15-18 gallon pot. Use potting soil, not garden soil or compost. I like Miracle Grow potting mix. Do not get moisture control. imafan26 wrote: What is in the soil mix? The soil mix was top soil, compost, and peat moss. Any reason not to use compost?? You can definitely use compost, just not as the primary ingredient. Only as a part of the mix. It is too heavy. Best to use a premade potting mix as imafan suggested. Aside from all the other good comments, the plants look like they need more nitrogen to me. this may sound dumb, but what should I do to give them more nitrogen? thank you all by the way for the tremendous help!! This is the fiancee making this post. We bought some nitrogen fertilizer tonight, but how much should we use per plant? I'm really hoping we can save these guys! Probly should have done some more research before I jumped into everything, but hopefully I can learn and do better next year! Thanks so much for all your help guys! 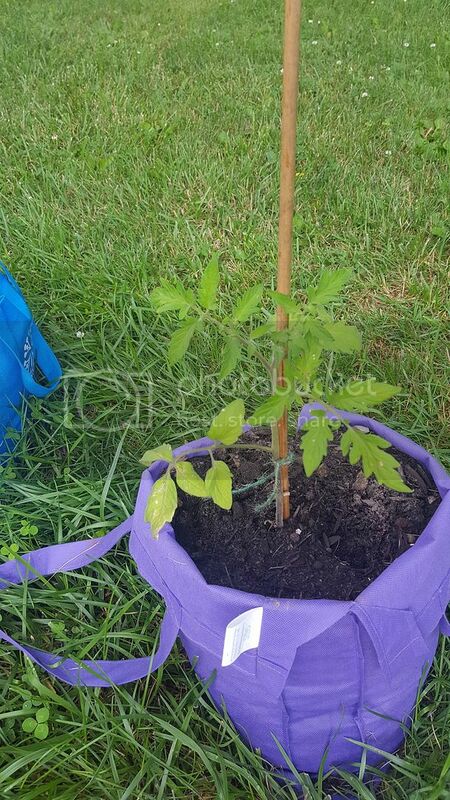 I fertilize my tomato seedlings with 1/2 strength miracle gro. I don't grow full sized plants in containers. Be very careful, too much can easily damage your plants. There should be directions, be sure to use the amount specified for potted plants and use 1/2 that strength to be safe. I wouldn't worry about rushing them into a bigger container as they are still smallish, except maybe that first picture. Make sure the container can drain and only water when the mix is dry knuckle deep or so. But also be careful not to let it dry out. I grow mine in 5-8 gallon pots. The 5 gallon I got for 3 bucks each at the dollar store and punctured holes in the bottom. I have a mix of loam, compost and peat moss in there, which I added pearlite and egg shells. If you can afford to buy potting mix, just use that. I had too many pots and it wasn't cost effective. 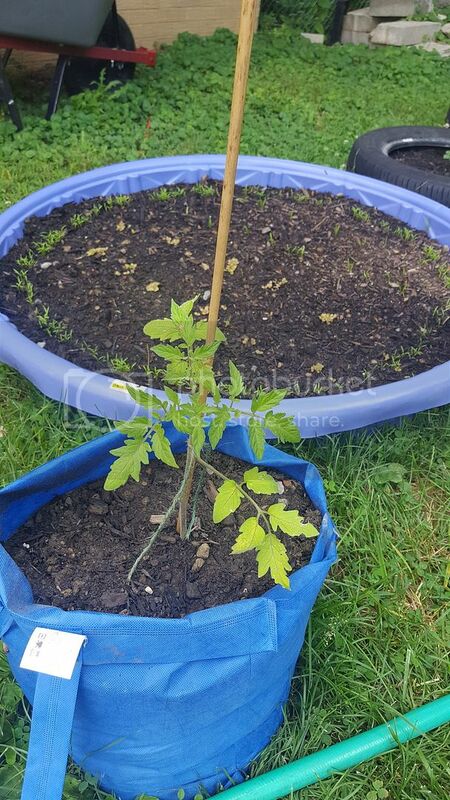 I have been watering with miracle grow for tomatoes, but at a weaker dilution once a week, as well as the odd feeding with fish emulsion and compost tea. Definitely get them out of the bags though. 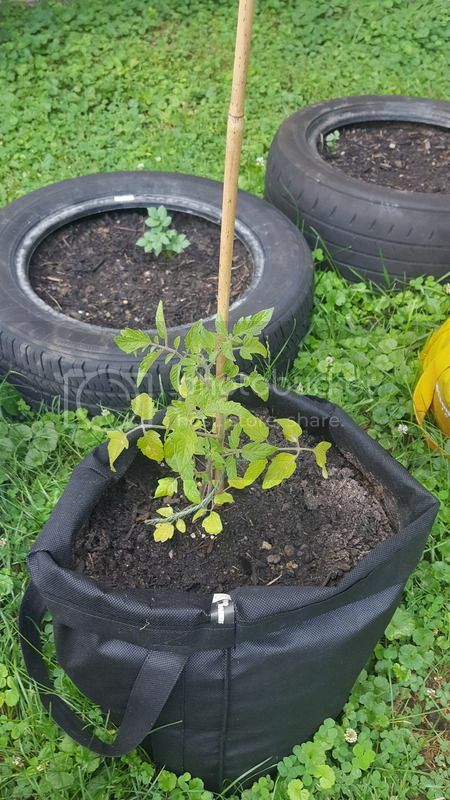 If you plant them in smaller pots, they wont grow as big and bushy, but I have had decent success growing them like that. I haven't seen any more yellowing since the addition of nitrogen fertilizer. On top of that, one of the tomato plants now has 4 flower buds (2 of which have opened up!). Our one plant, though, still doesn't look great (second to last). Some of the leaves are definitely dying. Should I go ahead and remove those dead/dying leaves? They're looking much better. Just leave them alone now to recoup. I wouldn't bother pruning anything off until they are fully recovered. You will be surprised at which leaves will go back to being green. You might end up losing a couple of leaves, but not much. Is your fertiliser JUST nitrogen or does it include anything else? TomatoGirl wrote: They're looking much better. Just leave them alone now to recoup. I wouldn't bother pruning anything off until they are fully recovered. You will be surprised at which leaves will go back to being green. You might end up losing a couple of leaves, but not much. Is your fertiliser JUST nitrogen or does it include anything else? I humbly disagree. I would remove those leaf stems that are browning, and severely yellow. They won't come back, and may actually invite fungal or bacterial issues in the future. 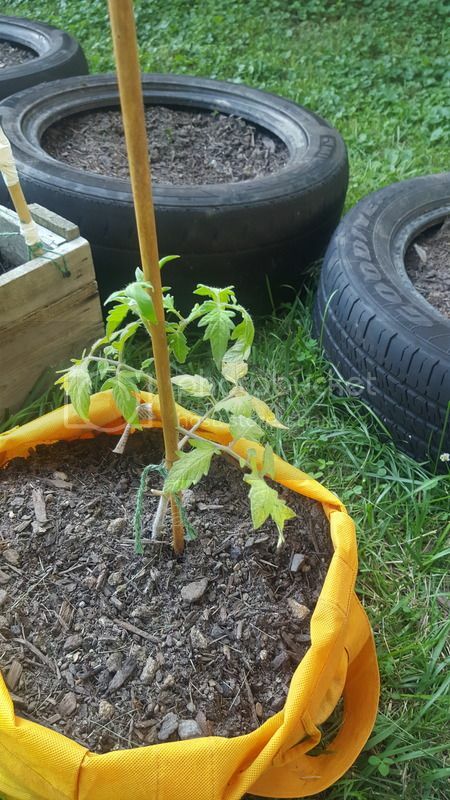 Tomatoes definitely don't mind a prune job! My only other addition to this, and it's already been mentioned, is that I really think these bags aren't going to work out for you. Not only for drainage issues, but also for their size, and heat transmission. I predict that they'll need upsized once your plants get larger. I also don't think that the roots wil stay cool. Are the bags designated grow bags?